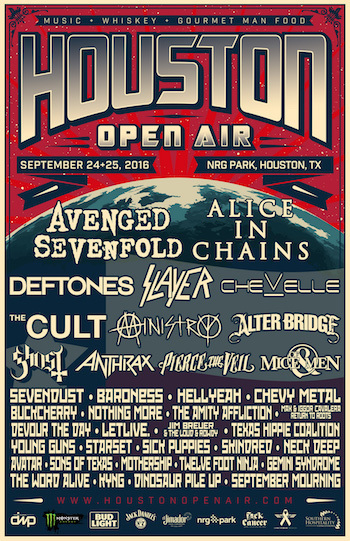 More details have been announced for the first-ever Houston Open Air, to be held Saturday, September 24 and Sunday, September 25, 2016 at NRG Park in Houston. Texas's biggest rock experience will feature performances from over 35 bands, including Avenged Sevenfold, Alice In Chains, Deftones, Chevelle, Slayer and many more. One lucky unsigned band will have the chance to perform at Houston Open Air through the ReverbNation online battle of the bands. For details, visit: www.reverbnation.com/submission/details?campaign_id=11001&in_preview_mode=true&show_s1=true&submission_intended_action=create_cpo_submission. In addition to three stages of top rock bands, Bud Light joins Houston Open Air as the official beer of the festival. 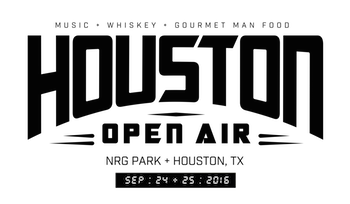 Houston Open Air features the celebrated Jack Daniel's Old No. 7 Whiskey Row, and a Texas-sized Gourmet Man Food experience, which will highlight Houston's emergence as a great American food city, and include the Tacolandia Mexican food village with some of Houston's top Tex-Mex spots. Weekend, single-day and VIP tickets for Houston Open Air are on sale now at www.HoustonOpenAir.com. Gourmet Man Food ("GMF") has been part of American culture since pioneers started experimenting with their cowboy menus to "kick things up a notch." Since then, it's become a phenomenon of artistically created, statement-making food, served in large portions with a powerful presentation. It is a unique twist to foods you know mixed with flavors you don't expect. Gourmet Man Food is not small portions on sparse plates, it's not pretentious, not for the faint of heart, not for a day you are counting calories, and, it's not just for men. Houston Open Air will feature food from several Houston favorites, with additional vendors from around the country. Along with its general admission and VIP Gourmet Man Food selections, Houston Open Air will also feature a local Tex-Mex showcase at Tacolandia presented by the Houston Press and Tabasco. 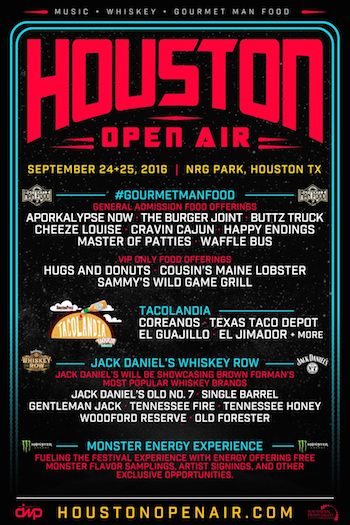 Visit http://houstonopenair.com/gourmet-man-food/ and http://houstonopenair.com/tacolandia/ for the list of food vendors and menu items. America, they say we're a nation divided. They say we disagree on everything, but they're wrong. We agree on a lot: liberty, justice, ROCK MUSIC, and beer. Nothing brings America together like Bud Light and nothing brings rock fans together like Houston Open Air. That's why we've formed the Bud Light Party — a party for everyone. We are the fake political party America needs right now and we're stopping by Houston Open Air to supply ice cold beer all weekend long. Because no matter where we stand on the issues, we all sit on the bar stools with our hands raised in the air listening to our favorite rock bands. America has seen the light, and there's a Bud in front of it. Jack Daniel's Old No. 7 Whiskey Row will feature the following brands: Jack Daniel's Old No. 7, Jack Daniel's Single Barrel, Tennessee Fire, Tennessee Honey, Woodford Reserve, and Old Forester. The Jack Daniel's Experience "Taste of Tennessee" invites visitors to come out and tour the nation's oldest registered distillery from outside the Jack Daniel's Hollow. Visitors get to see (and smell) whiskey dripping slowly through charcoal and the new oak barrels used in maturing Tennessee's finest whiskey. The Jack Daniel's Experience is open to all fans, 21 years old and up, for tours free of charge. Stop by the Jack Daniel's Experience for interactive engagements throughout the weekend. Houston Open Air and the curation team at ReverbNation will work closely together to select one ReverbNation Artist to perform at this year's festival. The chosen artist will perform at Texas' biggest rock experience alongside Avenged Sevenfold, Alice In Chains, Slayer, Deftones, and more. Head to www.reverbnation.com/submission/details?campaign_id=11001&in_preview_mode=true&show_s1=true&submission_intended_action=create_cpo_submission for contest rules and more details. Houston Open Air sponsors include: Monster Energy, Jack Daniel's, El Jimador, Fxck Cancer's Dyin2Live, NRG Park and SoHo Concessions, with more to be announced. NRG Park, home of the NFL's Houston Texans and the Houston Livestock Show and Rodeo, is located at One NRG Park in Houston, TX.